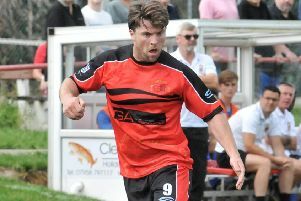 Gavin Clark scored both goals in Lancaster City's draw with Warrington Town on Tuesday night. An unlikely double from Gavin Clark saw Lancaster City fight back twice to draw with Warrington Town in their first home game of the season at Giant Axe. The visitors took the lead early on through Ruben Jerome with defender Clark’s first of the night levelling things up 20 minutes into the second half. Josh Hine then headed the visitors back in front 10 minutes from time on Tuesday night. Clark got his second of the game in the third minute of added time however, a brilliant effort securing a point for Phil Brown’s side as they continued a promising start to life in the Evo-Stik Premier Division. The Wire took the lead just 12 minutes in, Liam Hynes working well on the right to beat Clark before playing a fine ball to Jerome who buried it past Chris Cheetham with the home defence not able to track his run. Hine went close for the visitors in the 38th minute - cutting in from the right-hand side after beating Clark with ease, his shot forcing a brilliant save from Cheetham to his right. Lancaster started the second half much better than they did the first, but Warrington still carried a threat. Oliver Wood managed to get past ex-City keeper Tony McMillan with a lob two minutes in but it was covered by the visiting defence. Jerome then nearly doubled the visitors’ lead but it was cleared off the line by Clark, shortly before Wood was denied by the Warrington keeper to his left and the ball was cleared away. In the 67th minute Lancaster had their equaliser and it came from an unlikely source. Left-back Clark beat his man and then his long-range effort beat McMillan to his right. Warrington went back in front on the 80-minute mark, Hine taking advantage of the loose ball and heading past Cheetham who was off his line. Lancaster had a big chance to level in the 84th minute. Billy Akrigg’s pin-point corner reaching the head of captain Ricky Mercer who saw his effort come back off the post. Brown’s side piled on the pressure in the dying moments of the game. Clark headed over from a corner in the second minute of added time, but he made up for this shortly after with a brilliant goal. Similarly to his first, the former Morecambe trainee made ground down the left before striking the ball brilliantly with his right-foot into the top-left corner to send the home support wild and grab a late point. Lancaster City: Cheetham, Steel, Westwood, Mercer(c), Clark, Wills, Winder, Akrigg, S Bailey (C Bailey 57), Harries (Tam 85), Wood (Kilifin 85). Subs not used: Dugdale, Sumner. Warrington Town: McMillan, Richards, McCarten, Goulding, McKeown, Williams, Hine, Hynes (Vassallo 72), Hughes (Mwasile 63), Jerome, Gray (Barnes 54). Subs not used: Ashcroft, Carden.